Honestly, my mom made me go through recruitment. She wanted me to at least try it out before I formed an opinion on greek life. Once I was in it, I really had a great time getting to know everyone and being a part of something. Being a PNM (potential new member) was very stressful. I’m more of an introvert so it was scary going in and talking to several strangers. When you’re a PNM you think recruitment is the biggest deal, so its nerve-wracking when you’re waiting to find out if you get cut from a house. WHAT HAS YOUR EXPERIENCE (PRE PRESIDENT) LIKE BEING IN YOUR SORORITY? My experience before I was president was pretty good. There were definitely things that we did that did not make much sense, which was part of the reason I ran. Overall, it was a great experience as a member because I got to see what worked and didn’t work. I decided to run for president because it has always been something I’ve wanted to do. I never thought it would actually happen, but people kept encouraging me to go for it. Other people’s confidence in me really made my decision easy. HOW DID YOU FEEL WHEN YOU WERE ELECTED? When I was officially elected, it was really exciting! I was elected first so I had to wait for like 30 other positions to be elected to talk with anyone else about it. I was super excited, and then when elections were over and people were congratulating me, I started to realize that I had no idea what I had gotten myself into. I was scared about what things I might have to deal with as president. 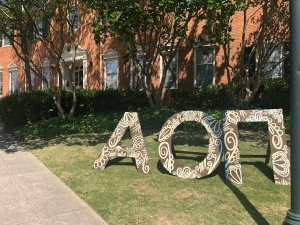 WHAT DOES A WEEK IN THE LIFE OF BEING AOII’s PRESIDENT LOOK LIKE? Every day is a little bit different. Every week, the officers all come together and talk about what things are going on with their positions. I am constantly getting texts and phone calls with officers and members asking questions. I usually have a few meetings with the head of greek life or other officers and organizations. HOW DO YOU BALANCE SORORITY DUTIES WITH SCHOOL AND YOUR SOCIAL LIFE? It is really hard to balance everything. I literally write everything down that I have to do, and I have to manage my time really well. I definitely have to stay more on top of my assignments and responsibilities so that I can hang out with my friends and have a social life. I always leave some time to hang out with friends because they are who keeps me sane. WHERE/HOW HAVE YOU SEEN YOURSELF GROW/CHALLENGED IN THIS ROLE? I have learned how to communicate better since becoming president. I am constantly talking to people inside and outside of the chapter, so I have had to learn how to effectively communicate with so many different people. I have also had to learn how to do deal with conflict resolution. There have been times where officers or members don’t agree and I have to be the mediator between them. WHAT IS YOUR FAVORITE PART OF BEING PRESIDENT? My favorite part about being president is getting to know everyone in the chapter. In this role, one of my jobs is to invest in all the members, and I have been able to meet so many new people that I would not have been able to meet otherwise. HOW DOES BEING PRESIDENT HELP YOU ENGAGE THE SAMFORD COMMUNITY? 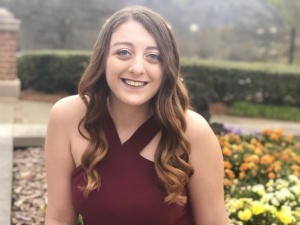 Through being president, I have been able to get to know the presidents from the other greek organizations, and other campus organizations in general. We are constantly meeting with each other to stay on the same page. We constantly have announcements from organizations in the Birmingham community, so it has been cool getting to know those people and communicating with them. I have gotten to see more of Birmingham from being president. WHAT ADVICE WOULD YOU GIVE TO SOMEONE WHO MAY WANT TO RUN FOR YOUR POSITION NEXT YEAR? Think about why you want to run. You need to make sure you’re running for the right reasons. You genuinely have to want to help the chapter out. Being president is not easy and it is not always fun, but if you have the sincere desire to better the chapter, and you make steps to do so, then it is totally worth it. 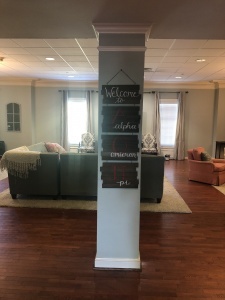 WHAT IS IT THAT MAKES AOII SPECIAL? Something that makes AOII special is how diverse we are. We have so many different personalities, and types of people. It’s really cool to get to know so many people who think differently than myself. We really have been focusing on showing how diverse we are in the last few years, and I think the chapter has benefited from that. We are all unique and different, and we want each member to know they are valued for who they are.